This restaurant has a humble beginning from a Cantonese Zi Char joint in the 1940s. In 1970, it moves to its current establishment in Amoy Street. 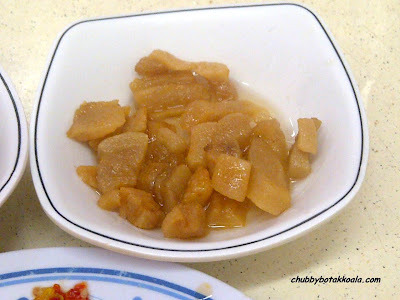 Many generations of Singaporeans grew up tasting their famous snakehead fish noodle soup, pork chop and their generous condiments of fried pork lards. The most interesting part, this restaurant is popularly known as Ka-Soh instead of Swee Kee. My first encounter with this place was in 2003, a good friend of my in-laws, Uncle E, who brought us here for lunch. Till today, I still vaguely remember the yummyness of their soup. Unlike many fish soup restaurant that add milk into their soup base, Swee Kee broth are made from lots of fresh snakehead bones and simmer over a long period creating the creamy milky colour in the robust soup. This time around, we stop by for a unplanned quick lunch. For 2 person, we had Fish slices with noodle soup (Signature fish) ($7.50), Hor Fun with dark sauce ($7.50) and Hong Kong Kailan Beef ($8.50). 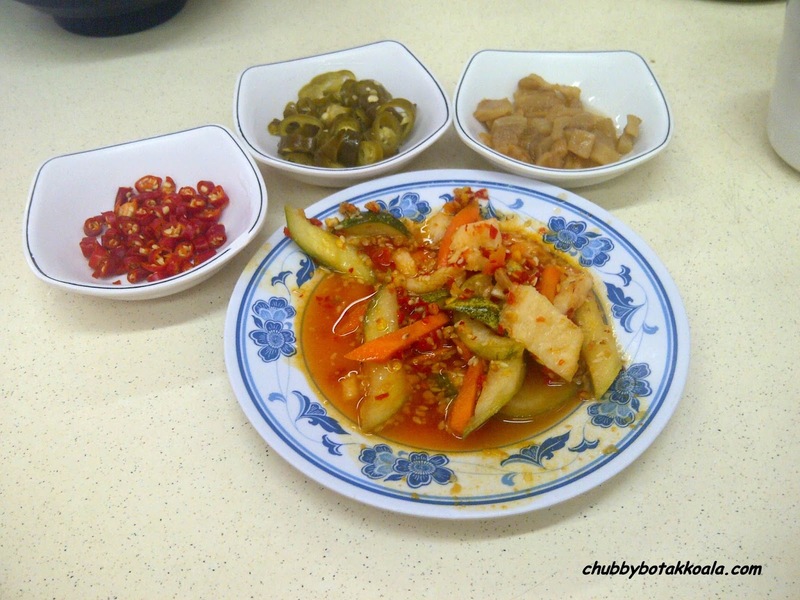 While waiting for our order to come, we were served some condiments to accompany our dishes such as Acar (Peranakan spicy pickled vegetables), red chilli, green chilli and pork lard. Condiments: Acar, red chilli, green chilli and pork lard. The noodle soup is as good as I remembered. The soup is milky and robust. You can tell from the taste, it is due to long cooking process that extract the goodness from the bones of the fish. 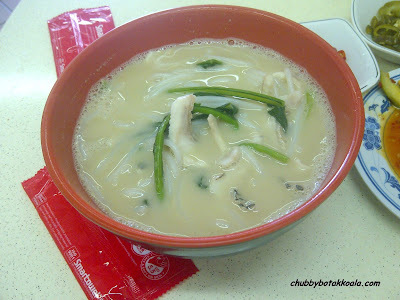 The thick bee hoon is springy in texture while the fish tasted very fresh. The best part, it goes well with the pork lard he..he..he.. The presentation of the Hor Fun simple yet effective. 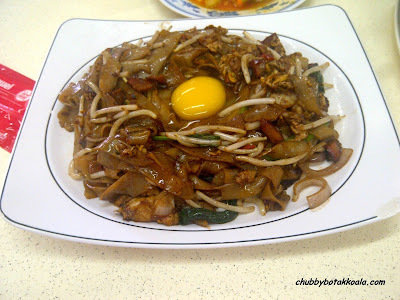 Topped with raw egg on top, this will ensure the fried hor fun will be smooth for consumption. 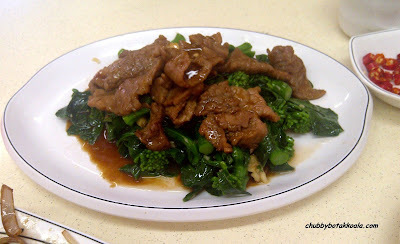 Stir-fried the traditional way, it might seems slightly oily but it is fragrant, delicious and strong wok-hei presence in the dish. Hong Kong Kailan Beef is supposed to be a combination of tender beef with crunchy Kailan. Although the beef already coated with flour, it is still slightly chewy. A simple complimentary dish. Simple and slightly ageing is the decoration of this place. Marble tables are the standard table during that time and still serve them well until today. Service staff is efficient. Cantonese is the main language here, but not to worry they understand Chinese and English as well. 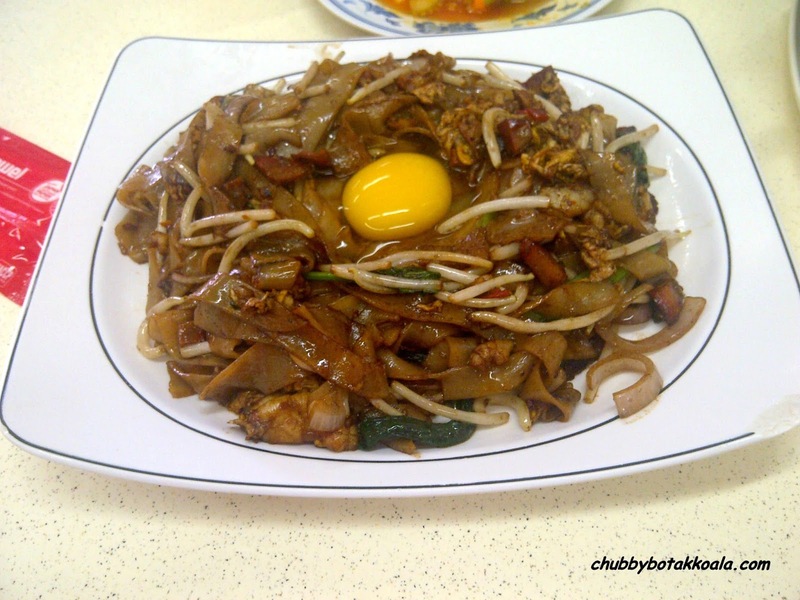 Overall, Swee Kee or famously known as Ka-Soh serve a traditional cantonese cuisine. It is simple, unpretentious and follow the old ways of cooking. Price is very reasonable. So if you feel like traditional cantonese fish head soup or hor fun, do drop by at Ka-Soh. Cheers!! !